With each Shanty Days festival there are lots of people around and with that, traffic delays and road closures. We want to help you plan your trip through town so we can all have a fun and safe festival weekend, so here is information regarding parking, street closures, and traffic delays. Pedestrians, please cross the street at marked crosswalks and cooperate with law enforcement at the intersections where they will be directing traffic. Drivers, please honor no parking areas marked by yellow curbs, and temporary or permanent no parking signs. Please do not block business or residential driveways. Allow extra time to get through town and take it slow. 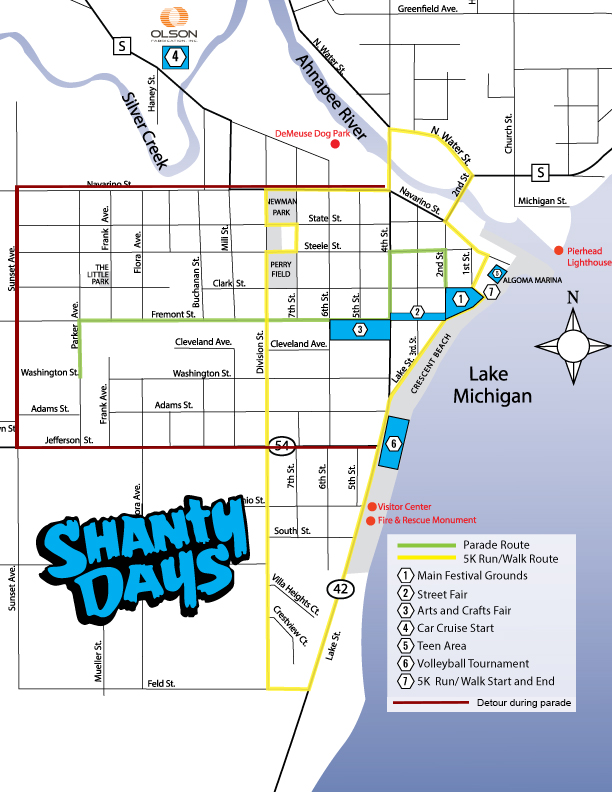 Consult the maps for more information about the 5K route, parade route, drone viewing area, and the locations of all the Shanty Days venues. Scroll below for the specifics regarding road closures. Thank you for helping make our Celebration of the Lake fun and safe for everyone! Click on the maps for larger view. There will be an intermittent traffic delay on Northbound Hwy 42 and Feld Street between 8:11 and 8:45 am. Please honor the NO PARKING RESTRICTIONS on the Northbound HWY 42/Lake St. between Feld St. and 2nd St. This is the RACE ROUTE (marked in yellow on the map) and we want to ensure the safety of our runners/walkers. There is no parking along the parade route (marked in green in the map) beginning Saturday morning through the conclusion of the parade. The Car Cruise will take to the parade route around 11:30 a.m. with the parade starting at noon and going until approximately 2 p.m. (end time will depend on length and speed of parade and could vary). Please do not block the entrances to businesses along the parade route that are open during the parade. Fremont St. from Parker Ave going east to 2nd St.
4th St. from Fremont to Steele St.
Steele St. from 4th St. to 2nd St.
2nd St. from Steele to Fremont. If you must get through town during the parade, the suggested detour (marked in red on the map) is, from the south, take Route 54 west to Sunset Ave. Turn right (north) on Sunset to Navarino St, then turn right (east) on Navarino. Suggested detour from the north, go west on Navarino St. to Sunset Ave. Turn left (south) on Sunset to Route 54. Turn left (east) on 54 until you get back to 42. You can still expect slowdowns but by taking the detour, you will avoid most of the crowded neighborhood streets. 4th St. and 2nd St. will be re-open when the parade is over with law enforcement directing traffic during peak hours. 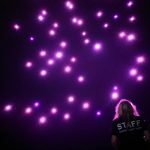 Lake Street and portions of Crescent Beach will be closed during the drone show on Sunday night. See orange section of the map. 2018 Shanty Days Photo Contest Winners Announced!